This entry was posted in Christmas Ideas on November 30, 2015 by admin. 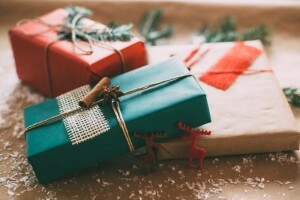 Are you having trouble coming up with the perfect holiday gifts for everyone on your list? Say no more! At Forever Bespoke we have a wide selection of bespoke gifts for the whole family. Check out our holiday gift guide for holiday presents that will make everyone smile. We all have that friend or family member who's always on top of the latest trends in fashion. Be the talk of the season by giving that persona a trendy yet timeless piece of jewellry. These stunning bracelets can be customised to bear the recipient's name or a heartfelt message for a gift that's stylish and personal. Bespoke Brown Leather Bracelet retails for £19.99. Silver Plated Heart Bracelet retails for £25.00. Perhaps your aunt collects puzzles. Or, maybe your grandmother loves to sew. For the hobbyist in your life, you can't go wrong with one of these custom bags! These bags are both fashionable and practical, and best of all, they can be personalised. 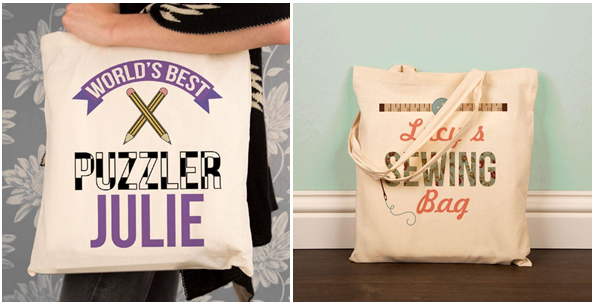 Personalised Best Puzzler Shoulder Bag retails for £9.95. Printed Sewing Storage Tote Bag retails for £9.95. For those who have long, busy work schedules, give them a reason to relax and unwind with a soothing bath set. The Distinguished Gent Bath Gift Set inclues dapper chap soap, wave hello shower gel, the distinguished gentleman body lotion, man grenade and the big blue soap, while the Three Little Birds Bath Gift Set includes springtime fantasy soap, daisy daisy bath buttercup, apple and raspberry swirl bath blaster, flutter by butterfly bath blaster and pink rhubarb encounter bath mallow. All of the products are handmade and come handwrapped in a beautiful gift box. The Distinguished Gent Bath Gift Set retails for £12.99. Three Little Birds Bath Gift Set retails for £12.99. Is someone on your list a travel junkie? These gifts are perfect for anyone who loves a good adventure. The Personalised Map Flask features a leather effect sleeve with a vintage-inspired map design and a lid that can be personalised with the recipient's initials. The Bon Voyage Acrylic Star features an image of a suitcase with the person's name and a special message and serves as a beautiful keepsake that can be hung on the Christmas tree or kept as a reminder of home during their travels. Personalised Map Flask retails for £19.99. Bon Voyage Acrylic Star retails for £6.99. 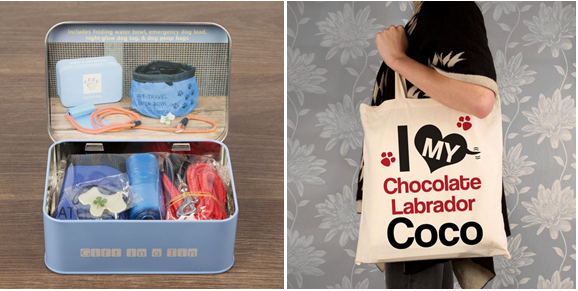 If you have a dog owner in the family, then these handy dog bags are the perfect gift. The Travel Dog In A Tin provides dog owners with everything they need for taking their dog to the dog park or for a walk— all in one convenient carry case. It includes a dog water bowl, emergency lead and dog poop bags. Then, with the I Love My Dog Personalised Shopper Bag, dog owners can show their love for their dog no matter where they go. This bag can be personalised with the dog's name and breed and is ideal for everyday use, shopping and going to work or school. Travel Dog In A Tin retails for £9.99. I Love My Dog Personalised Shopper Bag retails for £9.95. Spread holiday cheer with these wonderful gift ideas from Forever Bespoke. For more amazing gift ideas, visit us online at ForeverBespoke.co.uk!